Yes, that’s right, 258 starts. Won over $300K. And only four months after his last race, he stands tethered and in pain at that notorious kill pen. 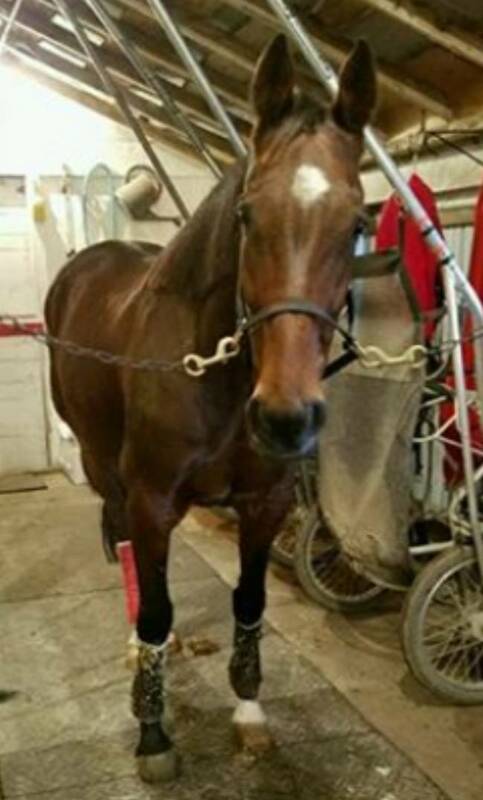 Killean Cut Kid, a 12-year-old Standardbred, was just acquired from the Bastrop, Louisiana, kill pen last Wednesday, August 30. According to the “Save Our Standardbreds from Slaughter” FB page, the gelding was due to ship to slaughter the next morning. 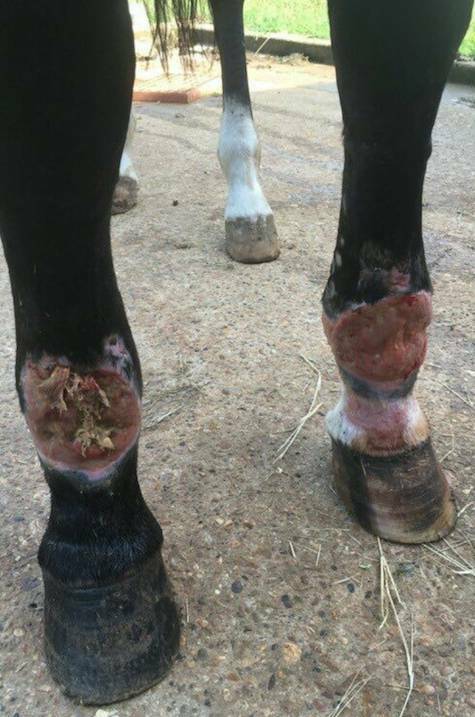 The photos of Killean Cut Kid standing tied at the kill pen are heart wrenching – his rope halter’s lead secured short yet with slack, the compliant bay’s front ankles have massive wounds that encircle them entirely. There are large areas missing hair and hide, some with the rectangular pattern of the purposeful shaving before a joint injection…swollen and angry-red proud flesh is present…as are the scars of multiple freeze or pin firings. One can only imagine the pain he has endured – and for quite some time. Any equine helplessly awaiting the tortuous transport to and the unspeakable butchering in a slaughterhouse is beyond horrific. But there is, at least for me, an additional and indescribable insult when that slaughter-bound sensitive being is one who was worked his entire life…the earnings of his labors, taken. Every cent. That is Killean Cut Kid. A Standardbred racehorse – a pacer, I read. 258 starts. Yes, that’s right, 258 starts. Won over $300K. And only four months after his last race, he stands tethered and in pain at that notorious kill pen. But there is more…actually, Jason Moore, Killean’s owner. On August 15, two weeks before the gelding was discovered at Bastrop, Moore had this to say on a social media site: “As many of you know I grew up racing dogs and I remember hearing people talk about horses and bonds they shared with them. So 4 years ago I decided to try the horse racing business.” After detailing his claim of Killean and the “bond” he formed, he concludes with this: “I’m saying my goodbyes to him hugging his neck with all my strength, balling my eyes out…[he] was trying to comfort me as I was falling apart.” Of course as I’m reading this, knowing where Killean was just found, I’m mystified, wondering how Moore is going to end this loving tribute to his “champion war horse” he just said goodbye to. “Bonded”? “Hugging and crying”? “Falling apart”? Yet he’s sending him to AUCTION? Can this get any more contemptible? Yes, actually. Back in April, from a Jones’ FB post about Killean winning a race, Moore replied to a comment of “Congrats” with, “It’s all heart cause if [you] saw his legs lol.” Lol. And earlier in the year, Moore and Jones reminded each other that their over-worked gelding was “just a 3 claimer.” “Yep. Just an old crippled rat.” “An old crippled rat.” Horrible people, horrible industry.